The launch of Albatross books in 1932 was a key moment in the paperback revolution, even if not fully recognised as such at the time. It signalled the imminent demise of Tauchnitz, which had dominated English language publishing in Continental Europe for almost a century. It was to be the inspiration for the launch of Penguin Books three years later. And it was in some respects the moment that paperbacks came of age in the twentieth century. A lot of planning and preparation had gone into the launch, which brought together three remarkable men, John Holroyd-Reece, Max Christian Wegner and Kurt Enoch. Their stories are too long and varied to cover here, but all three played important roles in publishing history, even apart from their time at Albatross. It was important for them that the first list of Albatross titles made a statement about the ambitions of the new series. It was a mixed list, establishing the principle that the series would cover a range of genres and styles. A crime story and a romance rubbed shoulders with more literary fiction. A volume of short stories was published alongside the first volume of an historical family saga. There was something for everyone, and importantly, with colour coding by genre, the mix of types of book was reflected in a mix of colours for the first six books. The choice of the first three authors – James Joyce, Aldous Huxley and Sinclair Lewis, seemed to say that the series would be more at the cutting edge of modern literature than Tauchnitz had been in recent years. It also said something about the ability of Albatross to attract authors away from Tauchnitz. James Joyce in particular had been neglected by Tauchnitz. 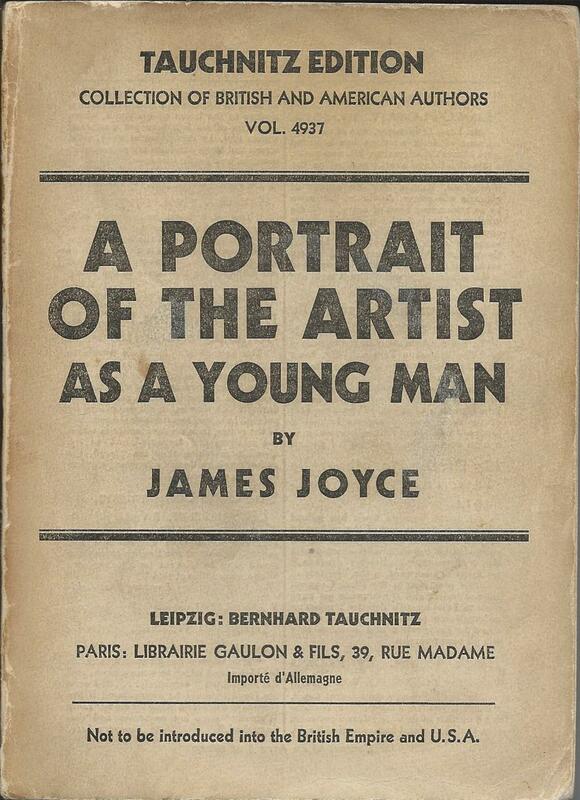 They had eventually published ‘A portrait of the artist as a young man’ in 1930, some ten years after being offered it, but had shown little interest in his other works. So for Albatross, publishing ‘Dubliners’ as volume 1 was an open goal. Huxley and Lewis had been treated better, with Tauchnitz publishing six volumes of Huxley and three from Lewis, arguably including their most important works. But that was far from comprehensive coverage and as with Joyce, Albatross was able to target earlier works, overlooked by Tauchnitz, before later publishing new works. Sinclair Lewis had in 1930 become the first American author to be awarded the Nobel Prize for Literature, so it was a good time to be revisiting his earlier works. The next three titles were perhaps a bit lighter, but Rogue Herries by Hugh Walpole was a significant prize. It was the first of the Herries Chronicles, a trilogy of books set in the Lake District, and probably the work for which Walpole is best remembered now. He too had to be attracted away from Tauchnitz, which had published several of his earlier works, as did Warwick Deeping. As Tauchnitz had had a near monopoly on publishing English literature in Europe, it was almost inevitable that the authors Albatross wanted to publish would already have had dealings with Tauchnitz. The launch of the first six titles was also marked by the issue of a boxed set of the six books. I have little idea how many of these were produced or sold, or indeed the price at which it was offered. I have only ever seen the one example, illustrated below, and that is in less than perfect condition. Although the box has no Albatross branding, I am pretty sure that it was produced for Albatross, rather than just being a home-made affair. It’s possible though that it was produced only for presentation copies, offered to business contacts and colleagues. Just one of the books in this box still has its transparent dustwrapper, and that is in poor condition, but all the books would originally have had them. They were easily damaged and after a year or so, new titles were instead given paper dustwrappers in the same design as the books. Albatross and the Third Reich. A Strange Bird, but a wonderful book. ‘Strange Bird’ is a wonderful new book by Michele Troy, subtitled ‘The Albatross Press and the Third Reich’. It vividly recounts the difficulties of a business publishing modernist British and American literature in 1930s Germany under the Nazis, and the lives of the key people involved as they cope with the sometimes brutal consequences. Michele Troy is Professor of English at Hillyer College at the University of Hartford in Connecticut. On one level her book is a meticulously researched academic study, where every assertion is backed by detailed research referenced in copious footnotes. But on another level it’s more like a novel, following the lives of a whole cast of characters, but particularly the three main founders of Albatross – John Holroyd-Reece, Max Christian Wegner and Kurt Enoch. The book is beautifully written, again more like a novel in places, but the story the author has uncovered is almost too implausible for the plot of a novel. There are twists and turns as the business has to adapt to Nazi control and suspicion, and the team is then split apart by restrictions on Jewish ownership of property in Germany. I won’t include too many spoilers, but the story reaches a climax with the German occupation of Paris in 1940. The contrasts in the experiences of the main participants at that point are almost heartbreaking, but there is far more to come. Triumph turns to disaster and disaster turns to recovery in very personal terms as well as in political, military and business terms. Holroyd-Reece, Wegner and Enoch all had very successful publishing careers separately from Albatross, both before and after the war, and they worked together for only a few years. I’ve long believed that in that short period they were able to create something really special, and that the Albatross series was a remarkable achievement in both literary and business terms. But I had little idea before picking up this book of quite how remarkable it really was. It needs the context of time and place, of everything that was going on in 1930s Germany, followed by the war and the post-war chaos, to understand the extent of their achievement. ‘Strange Bird’ brings together the context and the achievement and ties it together with the intertwining personal life stories of three remarkable men. All three died many years ago, but as well as researching many archives, Michele Troy has tracked down relatives and uncovered personal reminiscences that transform the book from a dusty academic work to a spellbinding thriller. Above all it’s the stories of the people that you come away with from this book. They’re engaging stories and engaging people, for the most part sympathetically drawn characters, despite all their faults. The book is part history, part biography, part novel, part academic treatise, part detective story, part bibliographical research, but above all it’s a thoroughly enjoyable read. I hope many more people will read it. For Part 1, follow this link. In 1934 Tauchnitz was on the point of collapse. Its brash new rival, Albatross, had succeeded far beyond its expectations and had stripped Tauchnitz of its sales, its authors and its prestige. Tauchnitz was ready to admit defeat and to agree to being bought by Albatross, but one thing stood in the way. The National Socialists, the Nazis, had just come to power in Germany, and Albatross was a company with multiple Jewish connections. In the political climate of the time, such a transaction was impossible. Instead a complicated arrangement was put in place where Tauchnitz was bought by Brandstetter, the German printing firm that printed Albatross books. 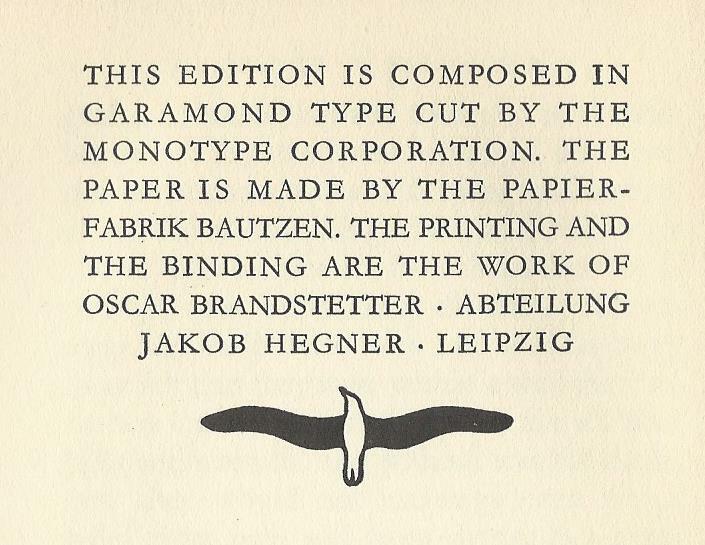 Brandstetter passed editorial control to Albatross, but kept the printing work for itself. From 1934, editorial control of both series was handled from Paris by Albatross. With Huxley and various other writers though, they had a problem. Their books were being burned by the Nazis and were appearing on various lists of banned books. Albatross / Tauchnitz had to tread carefully along a narrow line if they were to survive at all in Germany. They had to exercise some self-censorship not only in terms of what they published, but how they published it and where they sold it. The story is told in some detail and in very entertaining form in Michele Troy’s new book ‘Strange Bird. The Albatross Press and the Third Reich’. On the face of it, it made little difference whether books were published by Albatross or by Tauchnitz. 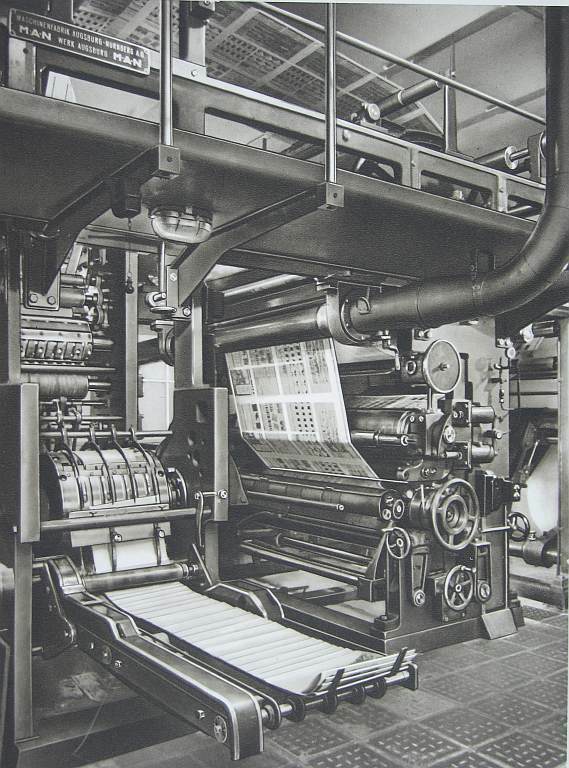 Editorial control of both series was from the same office in Paris, the books of both series were printed at the same printer in Leipzig, and they were distributed by the same distributor in Hamburg. But the evidence of the books suggests a different story. Tauchnitz after all was a German firm, with a higher proportion of its sales in Germany, and had to be extremely careful about publishing writers that were not approved of by the German government. Albatross, although coming under considerable German control, seemed to be allowed a little more freedom. Its books, printed in Germany, but sold across Europe, earned valuable foreign currency for Germany and the Nazis were prepared to be a bit more tolerant. But it seems clear that Huxley was no longer to be tolerated as a Tauchnitz author. He had moved to Albatross anyway for new publications, but even works for which Tauchnitz already had the rights were not reprinted. The Tauchnitz bibliography records reprint dates for the six Huxley volumes in Tauchnitz editions. Each was reprinted several times, but none of them after the end of 1934. A similar pattern exists for D.H. Lawrence and other writers not approved of by the Nazis. Instead Huxley’s books were transferred across to the Albatross series. The two volumes of short stories, ‘Two or three graces’ and ‘Brief candles’ were reprinted in 1935 as Albatross volumes 246 and 247, followed shortly afterwards by ‘Music at night and other essays’ as volume 260. ‘Point Counter Point’ appeared in April 1937 as volumes 331 and 332. Two volume, or even three volume novels had been a long tradition for Tauchnitz, although gradually dropping out of favour by the 1930s. For Albatross, they were almost unheard of. Longer novels appeared, not in two volumes, but in a larger ‘extra volume’ sold at a higher price. Presumably they could have done that with ‘Point Counter Point’, but, perhaps for contractual reasons, they chose to retain the Tauchnitz two volume format. Unlike Tauchnitz though, they offered the two volumes for sale together in a slipcase. This transfer of Huxley’s books across to Albatross was probably made necessary by implicit censorship, but it made some sense anyway for editorial reasons. Albatross had been the more modern, edgier series, and Tauchnitz the more traditional, conservative one, even before the takeover. With new books still being added to both series, there had to be some basis for deciding which books appeared in which series and Huxley fitted better into Albatross. The opportunity to develop a ‘collected edition’ of Huxley’s works in Albatross may have been too good to miss. On the other hand, shifting books from one series to the other could also have a financial impact. The two firms had different ownership structures, so profits from the books could end up in a different place. The Tauchnitz bibliographers, Todd & Bowden, accused the Albatross managers, particularly John Holroyd-Reece, of systematically transferring profits away from Tauchnitz, to the detriment of the new owners, Brandstetter. This is probably unfair, and seems to take no account of the difficult circumstances in Germany at the time. Whether the various dealings were fair to Brandstetter or not, depends upon the basis on which they went into the arrangement, what the ongoing financial arrangements were, and also on what was politically possible in 1930s Germany. They did after all buy Tauchnitz at a time when, without the support of Albatross, it had little future or value at all. It is likely that Brandstetter’s financial interest came more from printing the books of both firms than from the profits of publishing. But the details of the arrangements were to be of vital importance later when war came to separate the firms. There was still the question of whether any further new works of Huxley’s could be published. ‘Beyond the Mexique Bay’, appeared in Britain in 1934, nominally a record of Huxley’s travels in Mexico and Central America, but also including long sections that were critical of fascism and offensive to the German government. It could not appear in translation in Germany but it might be more tolerated in English. It did appear in 1935, as Albatross volume 269, but only after considerable self-censorship by the Albatross editors – “die Schere im Kopf”, or the scissors in your own head, as described by Michele Troy’s book. Even then it’s an open question as to how openly it could be sold in Germany as opposed to other European countries. It was followed by ‘The olive tree and other essays’ in August 1937 (volume 336) and then by ‘Eyeless in Gaza’ in January 1938 as volume 358. Finally in July 1939, only a few weeks before the outbreak of war, came ‘Along the Road’, another collection of essays, originally published in Britain as early as 1925, so another example of catching up with Huxley’s earlier works. 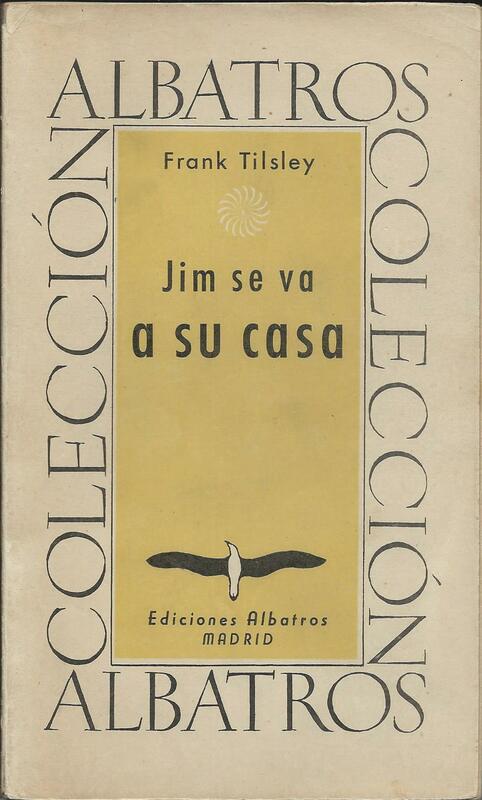 In total then, 14 Huxley volumes in Albatross, five of them transferred across from Tauchnitz (and one more that never transferred), covering almost all his pre-war novels and short stories, as well as a representative selection of his essays and travel writing. 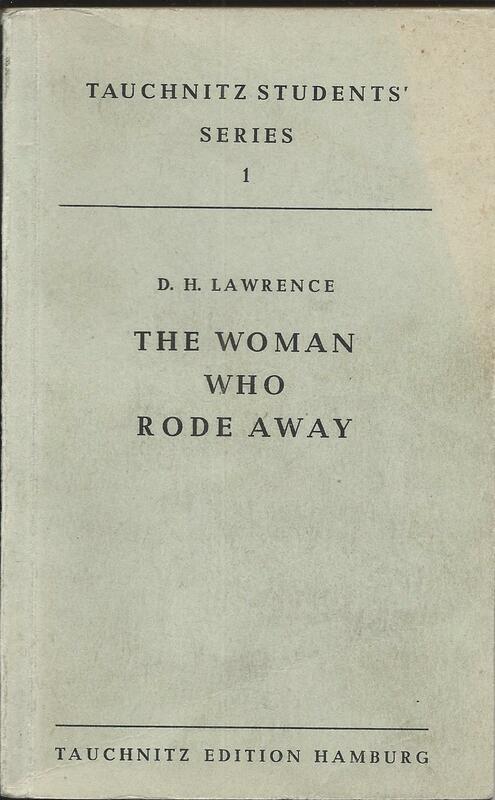 In the end only D.H. Lawrence accounted for more volumes in the series, although Agatha Christie was level on fourteen. For a series that was printed in Germany in the 1930s and a writer whose books were burned and appeared on banned lists, that was quite an achievement. Tauchnitz loved issuing celebratory volumes and had plenty of occasions to do so. The 500th volume of the series in 1860, the 1000th volume in 1869 and the 2000th in 1881 were all marked by specially commissioned volumes and by specially bound presentation copies to be offered to authors, friends and business contacts. Then in 1887 it was time to mark the 50th anniversary of the founding of the business, with a specially published history. Much of this is taken up with a long list of the works published by the firm, making it a rather luxurious catalogue, but it also includes excerpts from authors’ letters to Tauchnitz, which was to become a feature of subsequent histories. Volume 3000 seemed to slip by largely unnoticed, but volume 4000 in 1909 was marked by a ‘A manual of American literature’. This gave full recognition for the first time to the huge contribution from American authors to a series that for 70 years had been called ‘The Collection of British Authors’. Then in 1912 another anniversary history to mark 75 years. 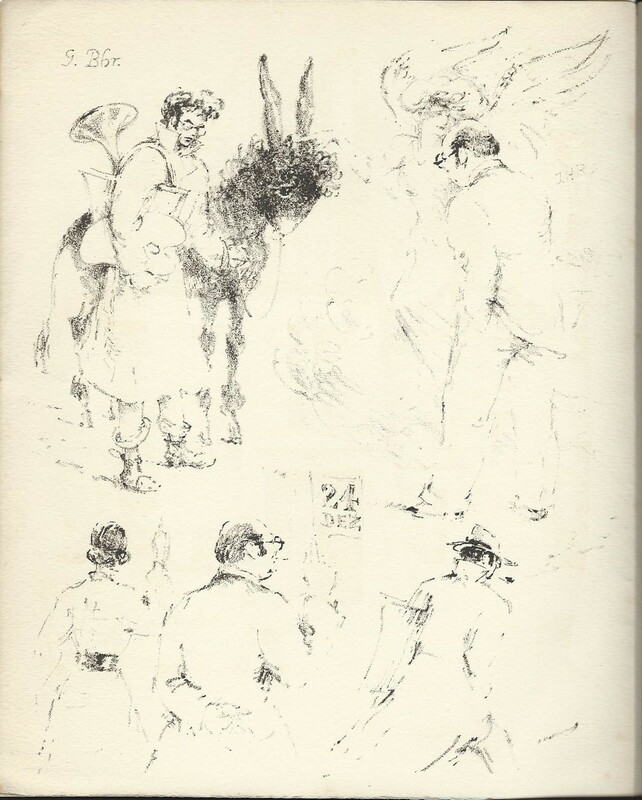 The catalogue of publications has now disappeared, and more prominence is given to letters from authors, with Charles Dickens pre-eminent among them. The milestone of the 5000th volume was reached in 1931 and celebrated with an ‘Anthology of Modern English Poetry’, but by then the business was tottering. It was sold in 1934, and lived on until the outbreak of war effectively as a sub-division of Albatross, the firm which had defeated it commercially. So when the time came to write its centenary publication in 1937 it must have felt to some in the firm more of an obituary than a celebration. The task of writing it fell to John Holroyd-Reece, the Managing Director of Albatross, and in the end he did Tauchnitz proud, although an early draft had contained a paragraph seeming to celebrate his own role rather too much. 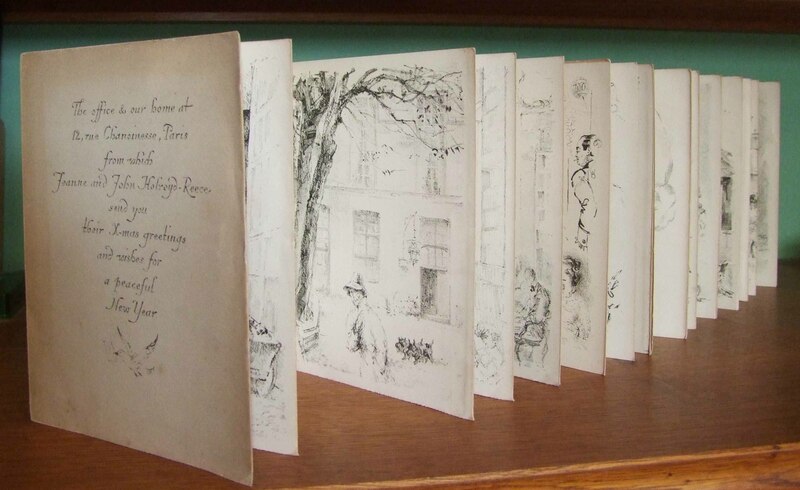 Again the publication included a selection of letters from famous authors, including Dickens and Disraeli, this time in facsimile form, and also a range of congratulatory letters from well-known people, including the British Prime Minister, Stanley Baldwin and the Archbishop of York. Slightly oddly, it was given the title of ‘The Harvest’, perhaps suggesting that the firm was now reaping the benefits of previous efforts, and no longer sowing new seed for the future, a position uncomfortably close to the truth. The book appeared in two different forms, one with cream paper boards, and one with gold wrappers, each with a blind-stamped Tauchnitz Centenary logo on the front. Neither version is difficult to find today. More interesting are the presentation copies prepared for authors and other friends of the firm. 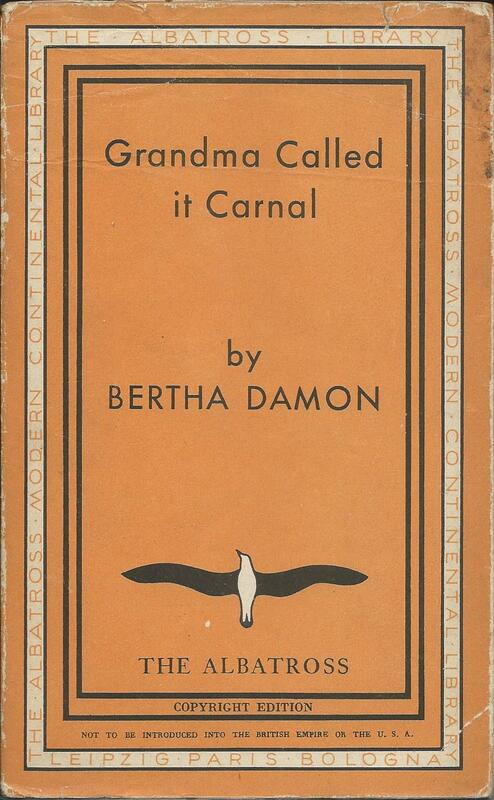 These are identical to the gold paperback edition, but the half-title is replaced with an individual printed page with the name of the person to whom it was presented. The copy illustrated here was presented to Janet Beith, the author of ‘No second spring’, published as volume 5157 in 1934. Other copies in public collections have the names of W.W. Jacobs, Louis Golding, H.M. Tomlinson and Helen Simpson. 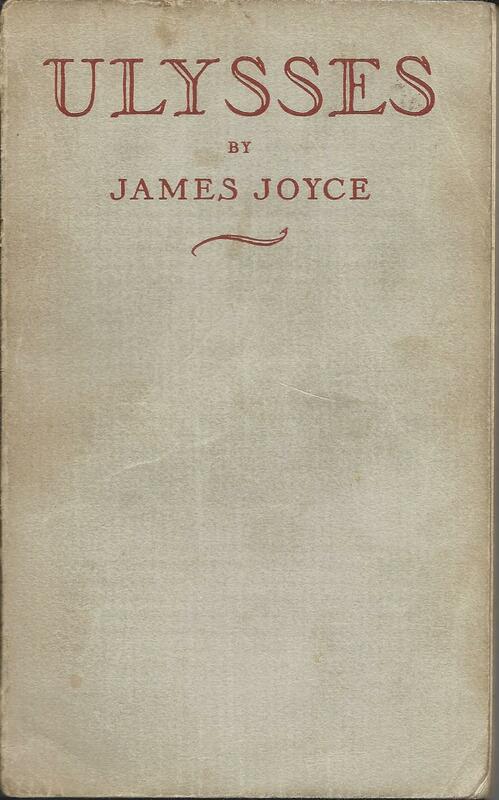 Presumably copies were printed with the names of all Tauchnitz authors still alive in 1937, which would have included, amongst many others, James Joyce, Virginia Woolf, Graham Greene, Bernard Shaw, H.G. Wells, Daphne du Maurier, Aldous Huxley, P.G. Wodehouse and A.A. Milne. As Louis Golding, whose copy survives, was published only by Albatross, never by Tauchnitz itself, this suggests copies may also have been presented to all Albatross authors. In that case, copies may exist with the names of Agatha Christie, Evelyn Waugh and Ernest Hemingway, amongst others. Publishing in the shadow of the Nazis. Tauchnitz, Albatross and Brandstetter in the 1930s. By the time the Nazis came to power in Germany in 1933, the firm of Bernhard Tauchnitz had existed in Leipzig for almost a century and had already survived a world war as well as the hyperinflation and depression that followed it. 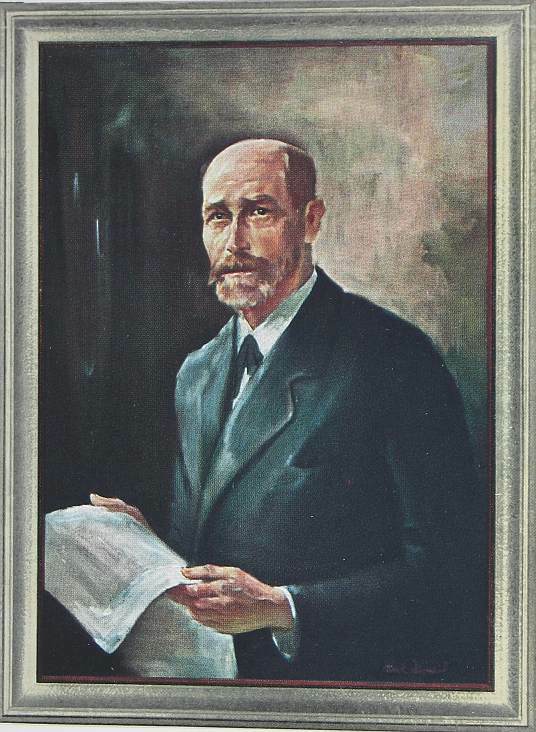 The printer and publisher Oscar Brandstetter, also based in Leipzig, was fast approaching its 75 year anniversary. Although the leaders of the two firms must surely have known each other within the Leipzig book trade, they were at that point unconnected, as far as I can tell. They were shortly to be brought together by the intervention of a third firm, Albatross, based not in Leipzig, but in Paris, and which had existed for only a few months. They presumably had little awareness of this, but may have had more awareness of some of the complications likely to arise from Hitler’s rise to power, which were to play a significant part in the coming together of the three companies. On 10th May 1933, in the Opernplatz in Berlin, German students and brown-shirted stormtroopers gathered to burn books that they considered un-German. 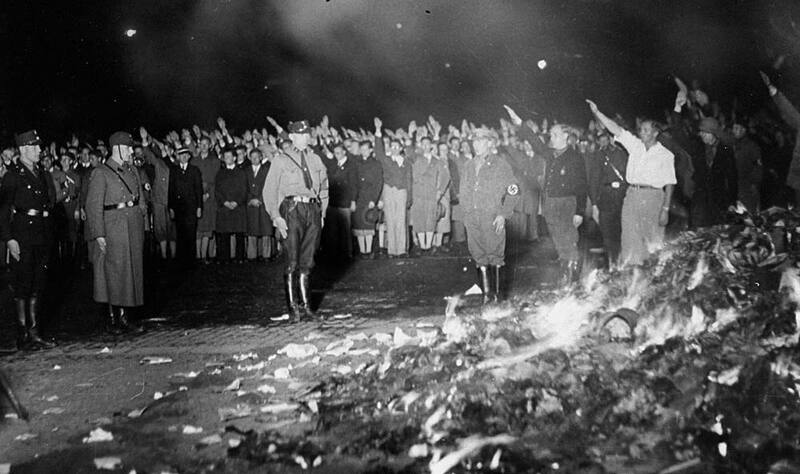 It was followed by ceremonial book-burnings in other German university towns, including Leipzig. Did a collective shiver pass down the spine of the German book trade, for so long based in Leipzig? 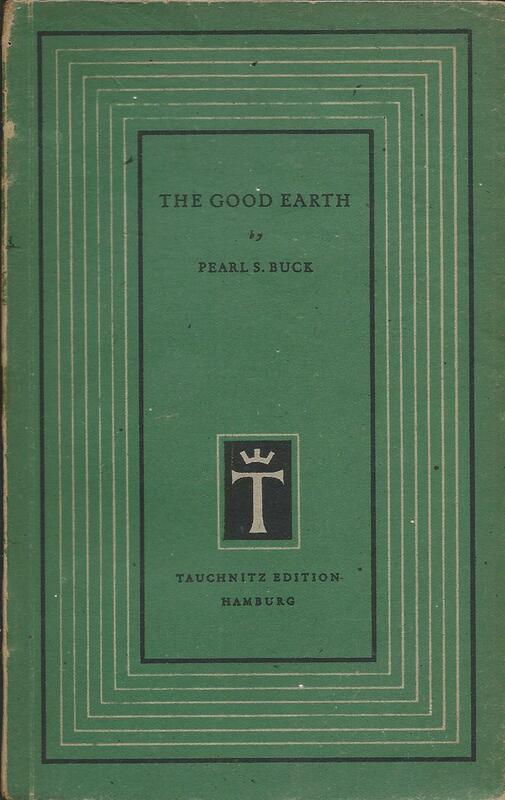 As well as the works of many prominent German authors, books by a long list of English and American authors were banned, many of them published by Tauchnitz, including H.G. Wells, Aldous Huxley, Upton Sinclair, Jack London, James Joyce, Ernest Hemingway, Theodore Dreiser and John Dos Passos. All of these writers had books published by Tauchnitz before May 1933. No further books by any of them were published after that date, although a few reprints with later dates exist, possibly only for sale outside Germany. Several of the banned authors had in any case already defected to Albatross, whose books were vastly more attractive than the Tauchnitz volumes, and had quickly established the upper hand in the marketplace. So in the face of a formidable competitor, Tauchnitz was being asked to compete with one hand tied behind its back. To make matters worse, Albatross was led by Max Christian Wegner, who had previously managed Tauchnitz in Leipzig, where he had tried to push through various changes, before the Board, finding his changes too radical, decided to part company with him. At Albatross he found a Board, led by the Italian publisher Arnoldo Mondadori, that was more attuned to his way of thinking and he was able to implement many of his ideas, with striking success. Amongst those ideas was the separation of the printing from the publishing side of the business. 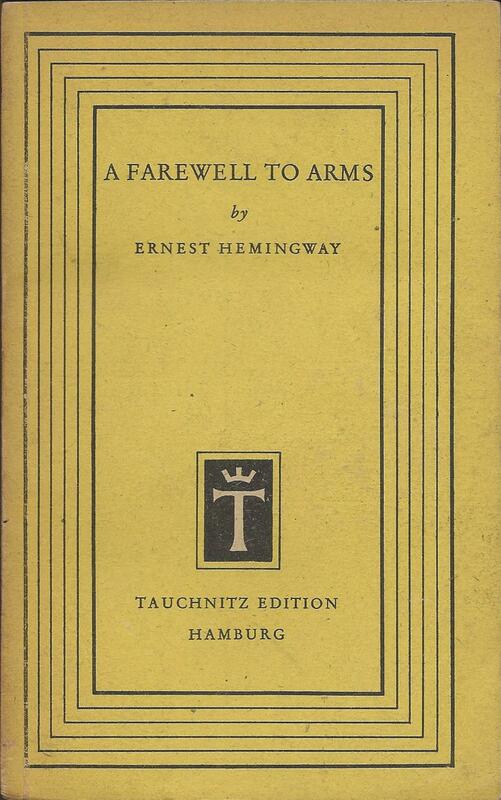 Unlike Tauchnitz Editions, Albatross books were never printed in-house. The first few were printed at Mondadori in Italy, but from volume 21 onwards, most were printed by Brandstetter, or more specifically by the Jakob Hegner department of Brandstetter in Leipzig. How did the contact with Brandstetter / Hegner come about? Had Wegner already had discussions with them when he was at Tauchnitz, possibly with the thought of them taking over the printing work for Tauchnitz? 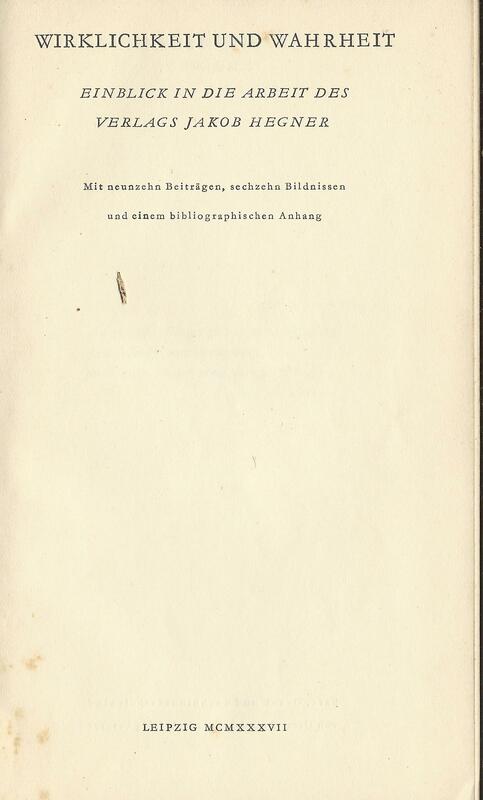 Up to the point when he left, in May 1931, Tauchnitz books had always been printed in-house, but by the end of the following year books were being printed by the Bibliographisches Institut in Leipzig or by the Offizin Haag-Drugulin. Was that one of the changes he had proposed? It would take more than a change of printer to save Tauchnitz though, and by mid-1934 its financial situation had deteriorated to the point where it was put up for sale. Although it was effectively unable to compete with Albatross, it had a back catalogue of over 5000 volumes that would have some value in the hands of the right owners, and in particular would have some value for Albatross. But it was not Albatross who bought Tauchnitz, despite the rumours circulating at the time. Albatross had too many Jewish links, both in terms of its owners and its managers, for that to be allowed in the political climate of the time. Instead there was an effective partnership between Albatross and Oscar Brandstetter, where Brandstetter became the new owner of Tauchnitz and took on all the printing work, while editorial control was taken on by Albatross. So Brandstetter may have been reluctant and largely nominal owners of Tauchnitz, there only to satisfy the authorities, happy to benefit from the substantial printing work, but with little interest in the publishing side of the business. It’s hard to know for sure. They were certainly not just printers. They did have other publishing interests, but publishing contemporary English literature would be quite a specialised area that they might not have felt able to take on. They surely would not have wanted anyway to go into direct competition with Albatross, one of their major printing clients. A partnership where Brandstetter were the legal owners of Tauchnitz, but Albatross controlled the editorial side, would tie the two companies together and guarantee a substantial volume of printing work from both businesses. But if that arrangement suited Brandstetter, other changes under way were more threatening. The department of Brandstetter dealing with Albatross was run by Jakob Hegner, who despite converting to Christianity, came from an Austrian Jewish family and was strongly opposed to National Socialism. He had been a publisher in Vienna, but his firm had run into difficulties in 1930 and was acquired by Brandstetter, with Hegner himself moving to Leipzig. In 1936 though he was excluded from the Reichsschrifttumskammer, which effectively barred him from the book business in Germany, and he moved back to Vienna, before fleeing to England in 1938 after the Anschluss. Interestingly Brandstetter published a short volume in 1937 celebrating the work of the Jakob Hegner business, with the title ‘Wirklichkeit und Wahrheit’ (Reality and Truth). The title came from a work by Josef Pieper published by the firm, but could it also have been a commentary aimed at the German authorities that had effectively driven the founder of the firm out of the country? Albatross had similar problems to deal with. The distribution business of the company was run from Hamburg by Kurt Enoch, who was also Jewish. Although a decorated officer in the German Army from the First World War, he was effectively required under the Aryanisation programme to sell his business, and he too emigrated, first to Paris and then in 1940 to the US, where he went on to work for Penguin Books and to found the New American Library. Max Wegner moved back to Germany from Paris to take on Enoch’s role in distribution, leaving John Holroyd-Reece in charge of the editorial side. Holroyd-Reece is rather demonised by the Tauchnitz bibliographers, Todd & Bowden, but almost certainly unfairly. He did have some potentially difficult decisions about which books to publish under the Albatross brand, and which in the Tauchnitz Edition, but did so in a way that distinguished the brand images – Albatross more edgy and modern, Tauchnitz more conservative and traditional. While Todd & Bowden accuse him of unfairly favouring Albatross, his decisions were restricted by censorship in Germany, and in any case the reality is probably that without the intervention of Albatross, Tauchnitz would have had no new publishing programme at all after 1934. They had failed commercially and anyone else would have struggled to compete with Albatross in anything other than reprinting previous successes from their back catalogue. Brandstetter, as legal owners of Tauchnitz would have had little cause for complaint about Holroyd-Reece’s stewardship of the company in the few years before the Second World War. Before the Second World War, Max Christian Wegner and John Holroyd-Reece had worked together in Paris to launch Albatross, first in competition to the old-established firm of Tauchnitz, and then to run the two companies as a joint operation. Wegner seems to have been more in control of the editorial side in the early years, but relations between the two may have soured, and in 1936 he moved from Paris to Hamburg, taking over the sales and distribution business from Kurt Enoch. From that point on, Holroyd-Reece ran the editorial side of the business from his home and office on the Ile de la Cité. When the war came, the two found themselves on opposite sides. Holroyd-Reece had been born in Germany as Johann Hermann Riess, but had become British and fled to London, with the Nazis appropriating the business and appointing a German manager to run it. After the war, he re-launched the business from the same offices, although he himself continued to live in London. Wegner meanwhile set up in effective competition, using the Tauchnitz brand from Hamburg. His short-term ambitions were relatively modest, and by 1948 he had re-issued about 10 of the previous Tauchnitz books in a new series, with no new publications at all. Those 10 were selected from the more than 5000 previously published by Tauchnitz. On the face of it, it’s quite odd to publish them as a new series, rather than under their original Tauchnitz series numbers, but it probably reflects the lack of clarity over rights to the Tauchnitz brand and copyrights. Wegner had no ownership of the original Tauchnitz firm and had simply created a new company, Tauchnitz Edition GmbH in Hamburg, taking advantage of the uncertainty over property rights in post-war Germany, as Holroyd-Reece was doing from Paris. 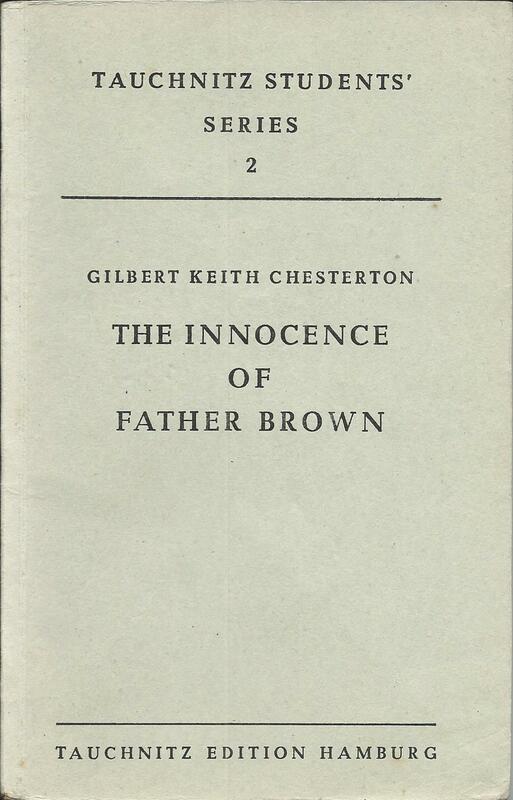 The post-war conditions in Germany however meant that the books were printed on poor quality paper and did not look attractive, either in comparison with the pre-war publications or with some of the same books being issued from Paris under the Albatross brand. Perhaps not surprisingly they don’t seem to have been a great commercial success. Of even more concern for Wegner though was that by 1948 Wolfgang Brandstetter, the owner of the firm Oscar Brandstetter, had succeeded in re-establishing his ownership rights over Tauchnitz. Wegner was effectively forced into a short term partnership with Brandstetter as joint Managing Director. As well as extending the series further to an eventual total of 18 titles, they also created a new Students’ Series aimed at German schools, again using texts that had already been published by Tauchnitz in its pre-war Students’ Series. The partnership between Wegner and Brandstetter was short-lived, and by 1950 Wegner was moving on again, forced out of Tauchnitz for the second time in his career. The Tauchnitz name and business was sold off, although the Students’ Series continued for several more years under a Brandstetter imprint. The attempt to revive Albatross after the Second World War lasted only 3 or 4 years, from 1947 to 1950. In fact most of the new works published in this period, at least in English, came in 1947. 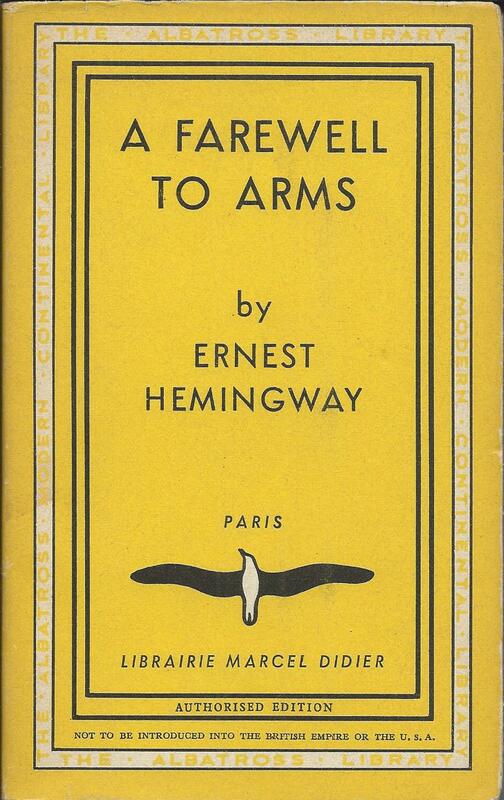 After that only a handful of new books were added to the main Albatross series, although it continued to re-issue books published before the war, and it also diversified into books in other languages. 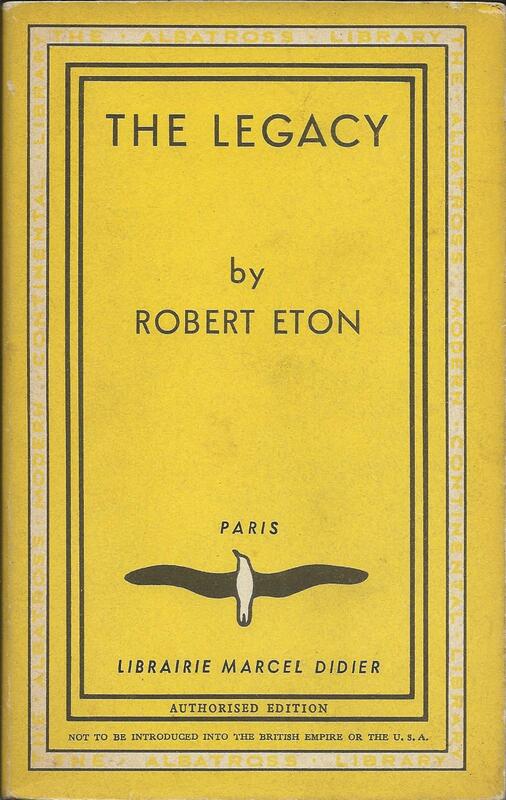 Albatross had been very successful as a publisher before the war, both in economic terms, and in literary terms, offering the first European publication to a succession of major novels by writers such as James Joyce, D.H. Lawrence, Virginia Woolf, Aldous Huxley, Robert Graves and Evelyn Waugh as well as crime writers like Agatha Christie and Dorothy L. Sayers. For much of that period it had been led by John Holroyd-Reece, who was also responsible for the post-war revival. Why could he not continue the record of success? The business re-started more or less where it had stopped eight years previously at the outbreak of war. The last books to be published had been numbered up to volume 514 and then volume 518, with 515 to 517 not appearing. After the war, the numbering re-started from 550, but three volumes with earlier numbers also appeared (516, 517 and 521), presumably because they were about to be published with those numbers when war intervened. It’s almost as if somebody just dusted off the old files and went back to where they were. In that first year of the re-launch, a total of 27 books were added to the series – not quite up to the rate at which books were being published before the war, but respectable enough. A significant number of volumes from the pre-war Albatross series were also reprinted, as well as a selection of pre-war Tauchnitz volumes in Albatross branding. It seems clear though that sales were not up to expectations and a high proportion of the books languished in warehouses. 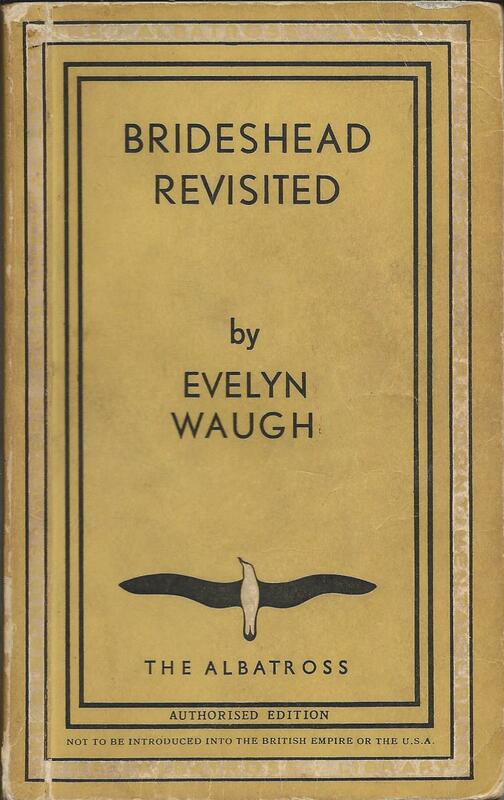 In literary terms, the highlight of the publishing programme was ‘Brideshead revisited’, newly published in the UK in 1945. Virginia Woolf’s pre-war novel ‘The years’ was also included, and there are books by Rosamond Lehmann, Agatha Christie, Siegfried Sassoon and Robert Graves, but the list lacks some of the sparkle of the pre-war years. Despite the backing of Collins, there was no return for the Albatross Crime Club, and only a small number of crime titles were added to the main series. With sales disappointing, the new publishing programme had to be cut back drastically, and I can only track down about three new titles published in 1948, another three in 1949 and then six in 1950 before the series finally expired. Quite why it failed, is hard to say with confidence, 65 years later. But conditions in the market had changed irreversibly. The massive success of Penguin, with their print runs of 100,000 copies, may have made it all but impossible for a small scale publisher specialising only in the Continental European market, to compete. Obtaining the agreement of authors, their agents or their UK publishers, to sell European paperback rights separately, may also have been increasingly difficult, when the market could be adequately covered by Penguin or other UK paperback publishers. The business did have some success with foreign language translations of English novels, and bound editions of the Albatross titles (possibly unsold stock re-bound?) continued to be sold in Europe, possibly for several more years after 1950, although it’s hard to be sure. But for the most part, by 1950 the game was up. The Albatross brand was about to disappear, followed not long after by that of Tauchnitz, the business it had first vanquished and then revived. At the end of the Second World War it was unclear exactly what remained of the combined Tauchnitz and Albatross publishing business that had been so successful before the war. Albatross had been owned by Sir Edmund Davis, who had died in 1939, and Tauchnitz had been owned by the printers Oscar Brandstetter, whose premises in Leipzig had been destroyed in an Allied bombing raid in 1943. The editorial office in Paris of the combined business had been taken over by the Nazis during the war, and although it continued to sell existing stock for a surprisingly long time, as well as launching a number of other ventures, the business had effectively disappeared by the end of the war. What did remain though were the rights to a backlist of almost 6000 volumes, containing the cream of English literature from the past century. For anyone who could establish their rights to this backlist, and to the goodwill and brand recognition that went with it, there was the possibility of re-creating a significant business. At least two men – Max Christian Wegner and John Holroyd-Reece – were interested in doing so. They had both worked for Albatross before the war, although relationships between the two seem to have been difficult at times. Holroyd-Reece chose to re-launch using the Albatross brand and series with the backing of Collins in the UK, and using the previous Albatross office in Paris, while Wegner attempted to revive Tauchnitz from Hamburg. It is unclear whether either of them could genuinely claim rights to the brand name or the Tauchnitz backlist, but in the chaos of post-war Europe, with uncertain property rights in Germany, that was perhaps not totally untypical. Wegner started with a short series of 18 books, published between 1946 and 1949, all of them previously published by Tauchnitz. 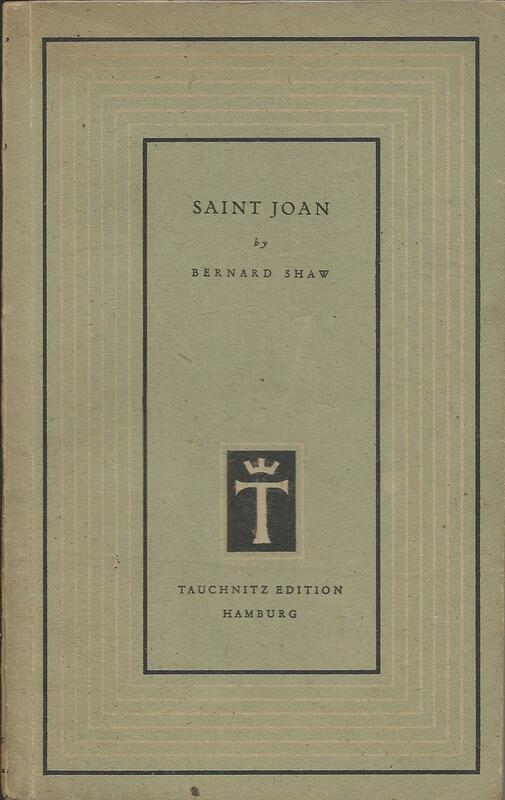 From 1948 to 1950 he added a Students’ Series of a further 12 titles, again drawn from the Tauchnitz backlist, and probably largely aimed at schools in Germany. Holroyd-Reece had rather larger ambitions, resuming the Albatross series with new titles as well as re-issuing pre-war titles. More controversially, he also re-issued books previously issued by Tauchnitz, in Albatross branding and format, but with their original Tauchnitz numbering. Some of these books were, at much the same time, being re-issued by Wegner in his Tauchnitz series. 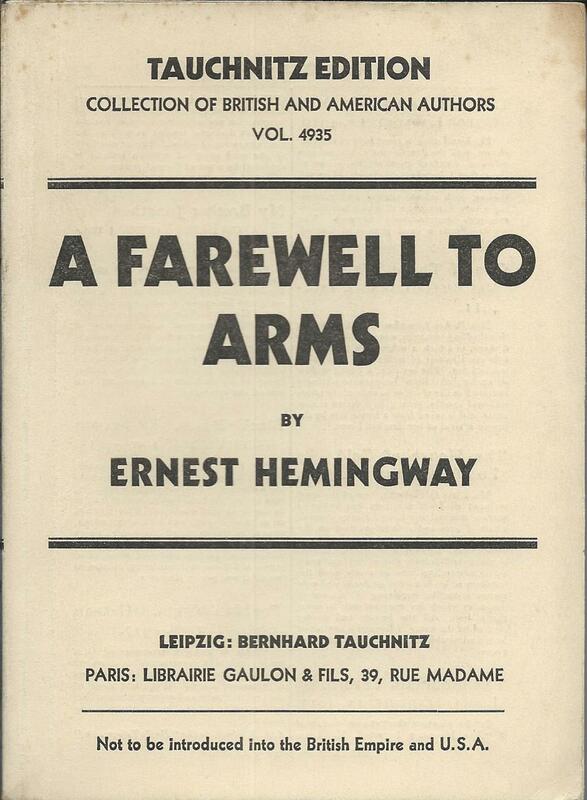 So for instance Hemingway’s ‘A farewell to arms’, originally issued by Tauchnitz in 1930 as volume 4935, also exists as Albatross volume 4935, issued in 1947, and then as volume 9 of the new Tauchnitz series, published in Hamburg in 1948. Wegner took steps to legitimise his claims to the Tauchnitz brand in 1948, by appointing Wolfgang Brandstetter, the owner of Tauchnitz, as joint chief executive. Holroyd-Reece on the other hand could claim that when Brandstetter had bought Tauchnitz in 1934, it had ceded editorial control to Albatross. Indeed the evidence suggests that the purchase by Brandstetter may have been little more than a political fig-leaf to cover the embarrassment of a German firm being acquired by a Jewish-owned business, shortly after the Nazis came to power. Brandstetter at the start probably had no interest in running a publishing firm, or ability to do so. However it’s doubtful that an agreement entered into in 1934 in Germany, was still valid in 1947, with all that had happened in the meantime. Even if it was, some payment would presumably have been due to Brandstetter. Of the two rival ventures, Albatross seems to have been the more adventurous and probably the more successful, launching a number of partnerships with other publishers. These led for instance to local language series under the Albatross brand in Sweden, Spain, Portugal and Germany. By 1950 though, both businesses were in terminal decline. Tauchnitz was sold and enjoyed a brief final resurgence in the 1950s, but in the end they were not really in competition with each other, they were both in competition with Penguin and the other new paperback publishers in Britain. The world of paperback publishing had changed for ever by the end of the Second World War and the conditions in which Tauchnitz and Albatross had flourished would never return. 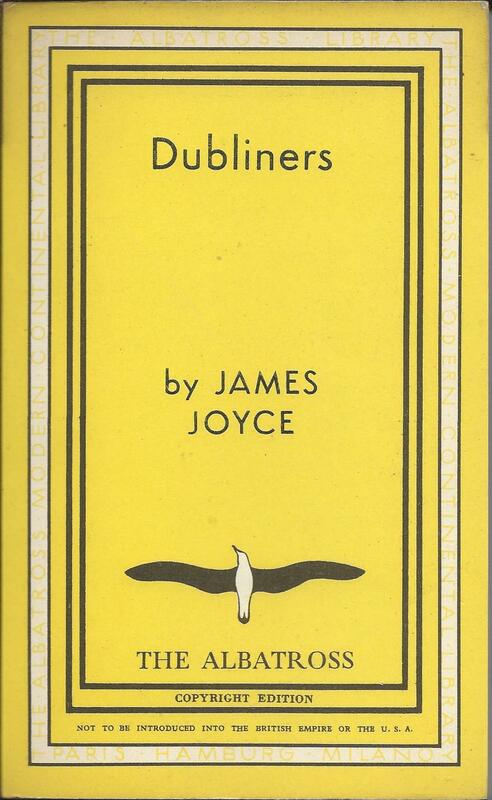 James Joyce has a special place in the story of Albatross Books. The very first Albatross, published in 1932 was ‘Dubliners’ by Joyce, and in some ways the connection goes even further back than that, to the point when Max Wegner became General Manager of Tauchnitz in 1929. By that point, Tauchnitz was living on past glories and had lost most of its earlier dynamism. Wegner set about shaking it up. Amongst other things, a search through the file found correspondence from Joyce 10 years earlier about plans for Tauchnitz to publish ‘A portrait of the artist as a young man’. It had never appeared. Wegner arranged for it to be published, and it finally appeared in May 1930 as Tauchnitz volume 4937. Other Joyce books might well have followed, but Wegner’s changes at Tauchnitz were too much for the Board, which forced him out by mid-1931. It was a catastrophic decision. Wegner played a key role in the establishment of Albatross the following year as a rival to Tauchnitz, and by 1934 the new firm had effectively taken over the old one. It seemed fitting that ‘Dubliners’ became the first Albatross book, rather than the 5000 and somethingth Tauchnitz. 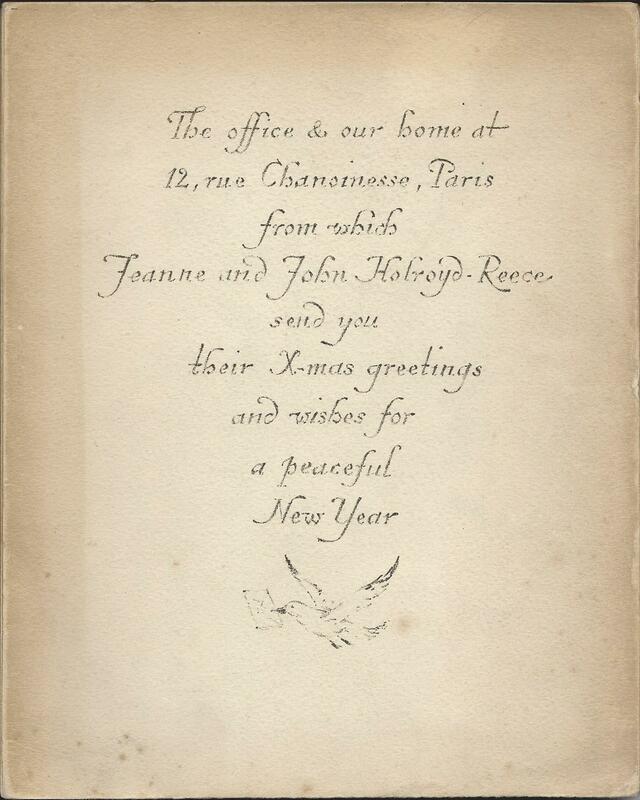 But Wegner and John Holroyd-Reece, the head of Albatross in Paris, had other plans in mind for Joyce as well. 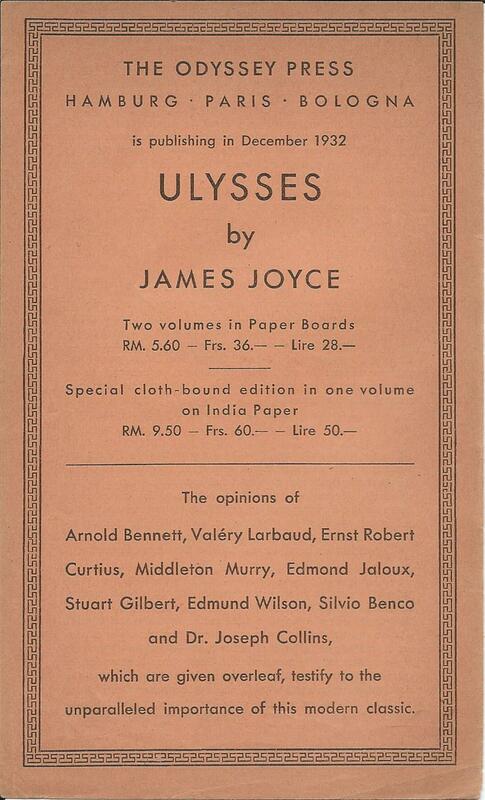 After ‘Dubliners’, it was natural to look next at ‘Ulysses’, which had been published in Paris 10 years earlier and reprinted several times, but was effectively banned in the UK. 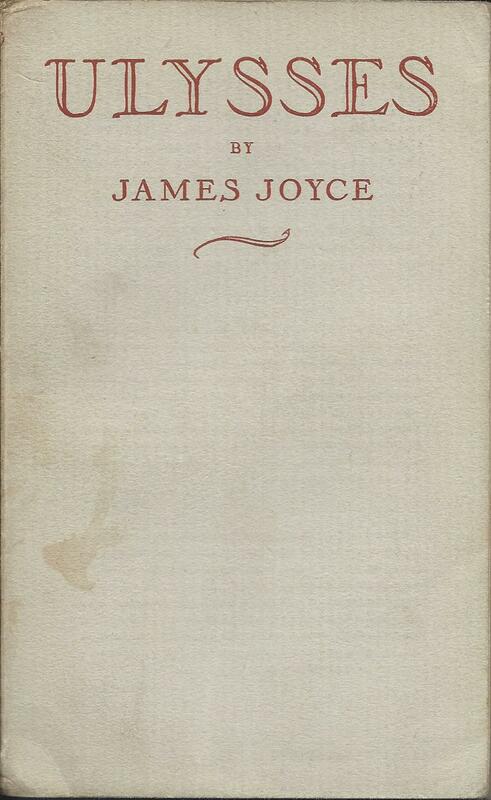 For the ‘Albatross’ edition, it was revised by Stuart Gilbert, at Joyce’s request, and carries a note saying it ‘may be regarded as the definitive standard edition’. That’s a substantial claim for a notoriously complex book that has been plagued by errors and misprints, but I think it’s fair to say that many people still regard this edition at least as an important one in the book’s publishing history, if no longer the definitive one. But is it really an Albatross? It doesn’t immediately look like one, published in two volumes in almost plain covers, and bearing the imprint of The Odyssey Press. It does though have the standard size of an Albatross and the layout of the books is almost identical to other Albatross Books. 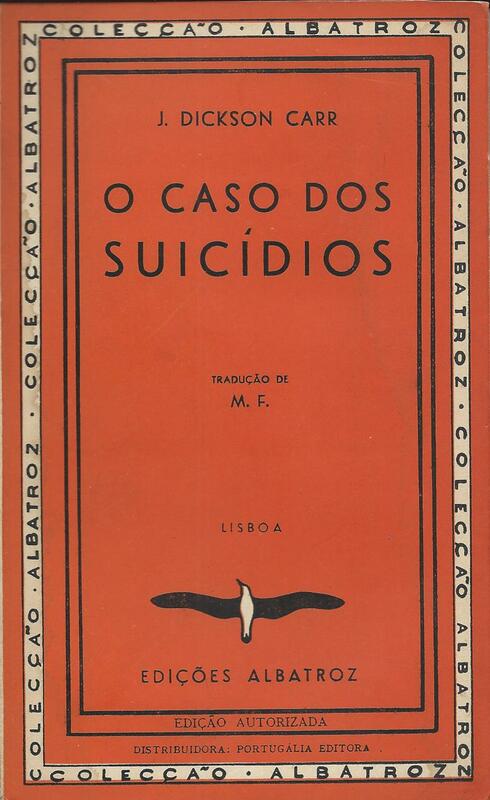 It has the typical blurb in three languages on the cover, the same style of title page and copyright notice at the front and the characteristic Albatross colophon at the back, showing it uses the same typeface, the same paper supplier and the same printer as other Albatross Books from that period. In practice The Odyssey Press (as the name might suggest) was an imprint set up specially for this purpose by Albatross, presumably because they were concerned that the book might not be consistent with the brand image they were trying to create for Albatross. They used the same imprint a few months later for publication of ‘Lady Chatterley’s lover’ as well – another book that at the time was banned in Britain. In some ways this feels like an excessively cautious approach to us now, but modern publishers too are concerned about establishing and protecting their brand image, so we shouldn’t judge them too harshly. And in reality it was an Albatross – indeed very specifically it represented volumes 43 and 44 of the Albatross Modern Continental Library. Those volume numbers never appeared on the book and Ulysses didn’t feature much alongside other volumes in Albatross marketing, so the numbers are missing from most Albatross lists of titles, but there’s no doubt that that’s what they were. Lady Chatterley’s Lover similarly appeared in plain covers, but was allocated volume number 56 in the Albatross series.